Sparkling clean and spacious. Janet was friendly and helpful. A great location just a few moments from Arinsal. Quiet and peaceful. I like everything about this place since this is the second time we have booked with them. Very spacious apartment in a super picturesque location. Charming decor, nice big bathroom. Well-equipped kitchen. The apartment was big and clean with all the facilities required. Nice and quiet area. Bus stop very near to the building. Perfect place for holidays. Lovely and helpful owners. Good location but I recommend to have a car. The apartment was nice enough and had a good amount of space for the 4 of us. The location was great and right between the 2 ski gondolas that we were planning to use. Lock in a great price for Chalet Janet Erts – rated 8.4 by recent guests! Featuring a private balcony with views of the mountains and an on-site bar, Chalet Janet Erts is located in Erts. This aparthotel offers apartments, duplexes and all bedrooms with private bathrooms. Free WiFi is available. Grocery deliveries and packed lunches are available. The property serves breakfast at an extra cost including homemade jam and organic products. Skiing is popular in the surroundings and there is a free bus service to the ski stations in Pal and Arinsal just 150 feet from the property. Activities such as hiking and cycling are popular in the summer months. La Massana Town Center is a 5-minute drive from Chalet Janet Erts, and Andorra la Vella city center is 5.3 mi away. Comunal de les Valls Nature Reserve is 3.1 mi from the property. 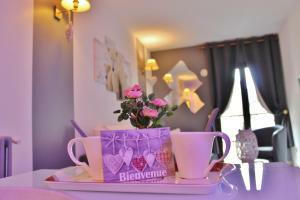 When would you like to stay at Chalet Janet Erts? Located on the 1st floor, this apartment features a balcony with views of the mountain. There is a kitchenette with a washing machine and a tumble dryer and a living area with a sofa bed and a flat-screen TV. 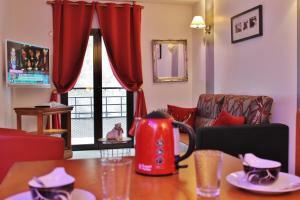 The apartment has a double bedroom and a twin bedroom, both with an an private bathroom. Free WiFi is available. 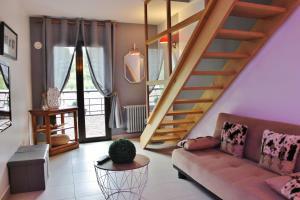 Located on the 2nd floor, this apartment features a balcony with views of the mountain. There is a kitchenette with Nespresso machine and a living area with a sofa bed and a flat-screen TV. 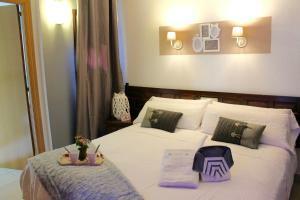 The apartment has a double bedroom and a twin bedroom, both with an an private bathroom. Free WiFi is available. Located on the 2nd floor, this apartment features a balcony and includes free WiFi, a living room with a flat-screen TV, a kitchenette with a coffee machine, and an private bathroom. Located on the 3rd floor, this apartment features balconies with mountain views and includes free WiFi, a living room with 3 sofas and a flat-screen TV, a kitchen fitted with a coffee machine, and a dining room with 2 tables. One of the rooms comes with a fireplace. There are 2 full bathrooms. Located on the 3rd floor, this apartment features a balcony with mountain views. It includes free WiFi, a living room with a flat-screen TV, and a coffee machine. The 2 bathrooms come with a shower. Located on the 3rd floor, this apartment features a balcony, private entrance and electric kettle. House Rules Chalet Janet Erts takes special requests – add in the next step! Chalet Janet Erts accepts these cards and reserves the right to temporarily hold an amount prior to arrival. Please note that the full amount of the reservation is due before arrival. AMP Group will send a confirmation with detailed payment information. After full payment is taken, the property's details, including the address and where to pick up the keys, will be sent to you by email. A damage deposit of EUR 100 is required on arrival. That's about 112.02USD. This will be collected by credit card. You should be reimbursed on check-out. Your deposit will be refunded in full by credit card, subject to an inspection of the property. Loacation is bad,so far away to downtown. When you checkout you must need to pay extra 25euros for cleaning fee per room. Everyday checkin time to short,If arrival at 7;30pm to check in,you need to pay more. I will be not coming back again. The room is not small. Arrival and parking was confusing. The entrance and reception is up a hill so it made the unloading of the luggage a bit inconvenient. Parking was across the street so that was OK (but we were there in off season - summer). In the photos it showed there was a jacuzzi spa, but when we arrived we discovered that the spa wasn't available to us or even on the same property. It was a different property that the host also owned and managed so that was a little bit disappointing. Also, upon check out the cleaning lady walked around the property counting every single fork, cup, pillow, towel etc. which I have never experienced before. It was a little over the top. They even wanted to check that we had taken out the trash. When I pay a cleaning fee, I don't expect to be checked up on about trash and other small things that should be included. Some amenities that should have been there, weren't. Tea & coffee would have been nice to have included. The landlord is dishonesty. We made a three day stays order. This order doesn't have the policy that the renter must clean the house when they leave. We cooked in house, but we didn't clean the house when we left. The landlord charge us a 750 EUR as penalty. My opinion is you can charge some money as clean fee, but 750 EUR is too expensive. The better method is you list your policies and penalties online! When we return the key and left there, my friend found she lost her watch and ring in house. We back to house and try to find it, but the landlord said she didn't find anything when she cleaned the house. The ring and watch is important to our friend, so we called the police. When we were waiting the police, the landlord opened the door, and put the watch and ring on flowerpot outside the door. It's too dishonesty, we were angry!!! It is really a unpleasant experience. the location is a 20 minute walk from the centre of Arinsal. Clean , nice quaet place . Worth money. When we checked out whilst waitng for the bus back, one of my friends needed the toilet and the reception cleaner wouldnt let her use the toilet! The door was open and she locked it on her! Also breakfast was some times stale!